Bonnie Hunter has written a new book and you can preorder it now – give us a call or shoot us an email, and we will add your name to the list and save a copy for you! 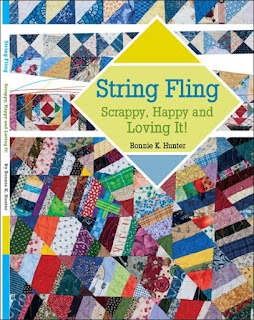 String Fling will be available for pick up in mid-July. Start sorting your stash and get ready to fling your strings! We are going to offer a class on Saturday, August 11 to teach string block assembly. This class does not require a book or pattern but we are sure that when you complete your first string block and then your first string quilt, you will be hungry as can be for more patterns and inspiration to use up your stash. It’s a fun and easy project that is as simple and economical as can be. The quilt you make can be as big as you want, or as small as you would like it to be. The fabric you use can be brights, civil war, batiks, patriotics, a combination of all, or whatever suits your mood and stash. Below is a baby floor quilt using brights – this will make a wonderful baby shower gift and it used up a tremendous amount of scraps from Susan’s stash! 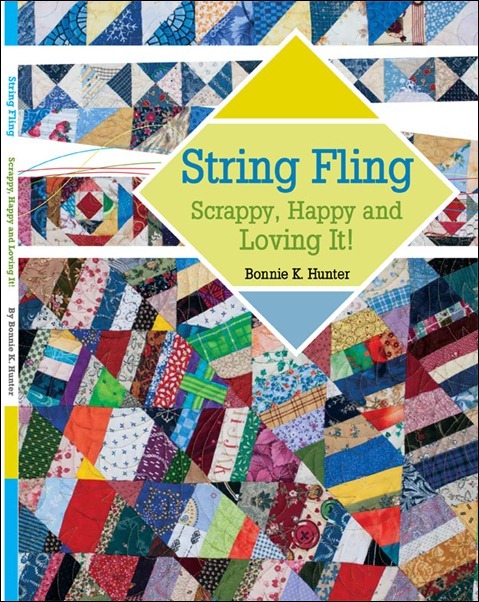 Call today to reserve a spot for this Scrap Busting String Quilt Class! The supply list is available at the store or request it via email. In honor of our nation’s birthday we will be closed Wednesday, July 4th to consume hot dogs, hamburgers, baked beans, potato salad and coleslaw! Many of you loved the “Itty Bitty Pinwheel Quilt”. 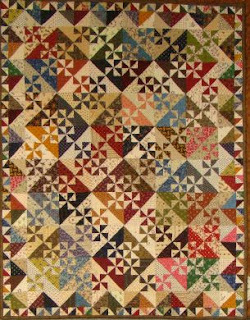 Here is another stunning small block quilt created using traditional piecing techniques. This miniature quilt finishes at 22” x 28”. Use up some of your own scraps like Linda did or pick up some fat quarters to fill in where needed. This is a two day class. On Wednesday, June 20, you will learn how to piece the 3” pinwheel blocks and on Wednesday, June 27, you will make the border and work on quilt assembly. Class fee for both days, $30. Pattern required. The class is filling up, so call today to reserve your space and receive the supply list. 727-461-4171. Linda Simons is an award winning quilter who we are very pleased to have teaching at our shop. She splits her time between Tampa Bay and the Atlanta, Georgia area.